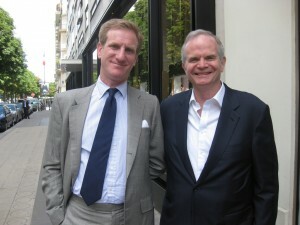 We started out the day with lunch at L’Avenue with our Paris-based friend James Lieber. James and MrB on Avenue Montaigne. After lunch, MrB and I headed to an exhibition of graffiti art called Born in the Streets. 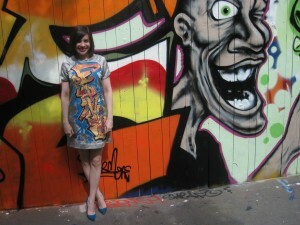 I was thrilled to be able to wear my new Francis graffiti dress while surrounded by graffiti. It was the real-life version of my Alexander McQueen dress project. The backgrounds I’m standing against were painted outside the building in honor of the exhibit inside. But as we walked away, I noticed other, less-official-looking graffiti. 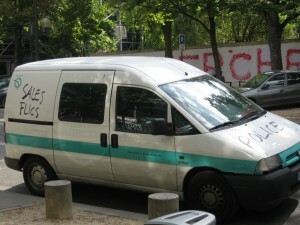 This van had “Police” scrawled on the front and “Flics” (French slang for police) on the side. I wondered if this was part of the show. 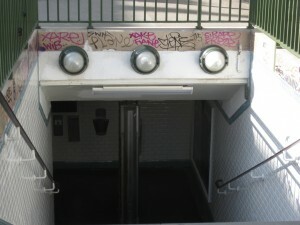 The entrance of the nearby Metro station was also covered in graffiti. Now I have a song by Berlin stuck in my head. On the way to the Metro, I was intrigued to see a woman walk by wearing shoes that were the same color as mine, so I took a photo of her too. Don't step on our blue suede shoes. MrB and I ended the day with a bistro meal at an outside table, enjoying white wine, perfect weather and le second-hand smoke. UPDATED TO ADD: Thanks to everyone who told me the Ossie Clark news. I’ve actually known about this for more than a week now via my friend Al Radley, but I was unable to say anything ahead of the official announcement. I think it’s for the best. Al can relicense the name to someone who won’t make a mess out of it. As for what happened, the CEO, Roland Green, seemed like a reasonable guy. 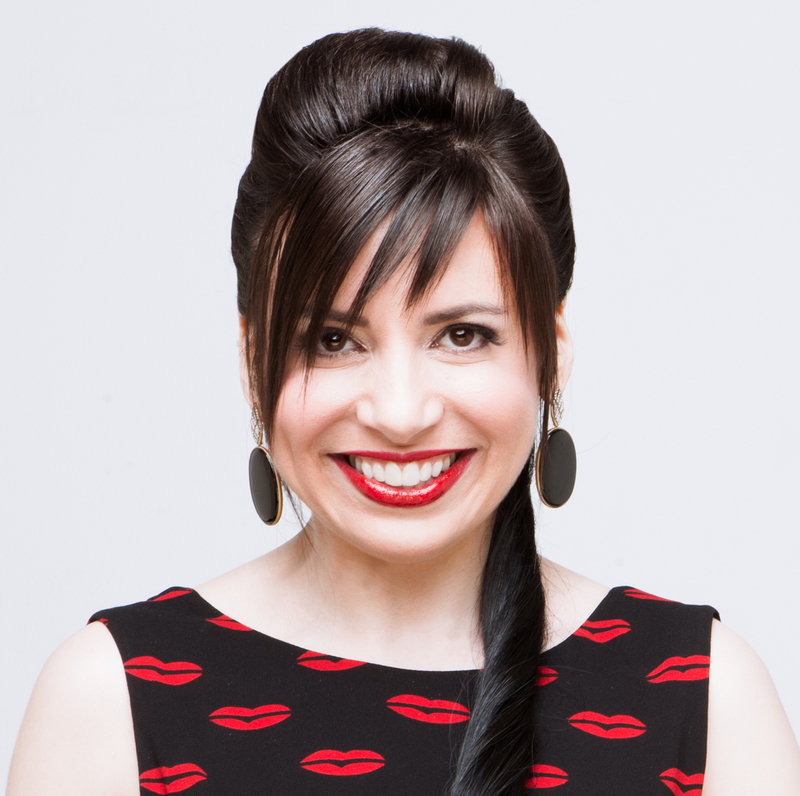 However, I thought Avsh Alom Gur wasn’t the right designer for the brand and that the financial backer, Marc Worth, didn’t have the proper strategy to make it a success. I hope to see the line revived again at a lower price point…with me as creative director, of course! That dress is so cool, epsecially when worn infront of a graffiti covered wall. Classic song, the Metro, now I have the square wave keyboard solo in my head and can’t get it out… thanks for that. Yesterday I was admiring your Graffiti dress and didn’t notice your shoes till today. Shame on me! Graffiti as art is just fabulous, its amazing how talented these people are!! You look like you’re having such a great time, but then you always do! While you’re in Paris, visit my favorite restaurant, le Christine. It’s in the 6th on rue Christine, just off the rue Dauphine a bit south of the river. You won’t regret it, I promise! I think graffiti is what I took the most pics of in Paris. It’s art!! i had an art teacher once who did a wall in the room of graffiti it was so neat it definatly is art! Too bad about Ossie closing, but I agree it’s for the best, and maybe a new team will buoy the brand. I took your threat seriously and voted love for Christian’s dress. Not that I really needed a threat or anything, but seriously rapid squirrels with egg hurling abilities is really scary. 🙂 By the way I loved playing Where’s Wendy. Great pictures as always. Love this travelogue! And you rock the graffiti dress like no other. Love the graf dress and blue suede shoes. 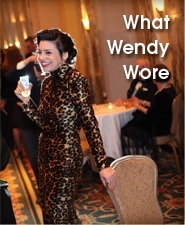 WendyB, lookin’ super-foxy and making American tourists look good where ever she travels. oof – the police graffiti says “Dirty Pigs.” Someone’s sporting a grudge! wow the grafitti dress is bold, but you wear it well! Your dress really is amazing! wow wow. oh you look lovey in graffiti camouflage! oooh I am so jealous of this trip! Adore the graffiti dress, the photo with the graffiti, the dress, and you is brilliant. It really shows the relation between art as fashion on an artist. Love it! This is really cool – I like your shirtdress! This dress is really fun! I luv your dress it’s fashionably ingenious! I didn’t want to endure the series of rabie shots sooo I did vote for the fantastic Francis Map dress and I am solely glad I did because I luv it!!! Love that graffiti dress, also love the print of the subway map. oh i’m so jealous that you’re in paris – it looks so wonderful! and love the colorful shoes! 😀 i just got back from travelling, and took quite a few photos of graffiti and wall art as well. I love the graffiti photos. And I also love that you took a snap of the lady wearing the blue shoes. Once I saw a woman walking down Broadway from Columbia U. with a ball-jointed resin doll sitting on her shoulder. My heart fluttered. It was if I’d just seen my doppelganger (in a good way, not in a harbinger of death way). I made Ron go with me as I trailed her for six blocks to her apartment (I didn’t go in). I WISH I’d taken her photo. Sigh. 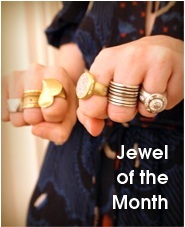 On another tangent, I’ve started my own style blog at http://www.therenegadebean.com. I’d be honored if you’d drop by and take a look. You look like you are having a grand time and the dress looks fab. Wait..I’m gone a mere two weeks and you went to France without me. We’re going to have to stern talking missy when you get back!